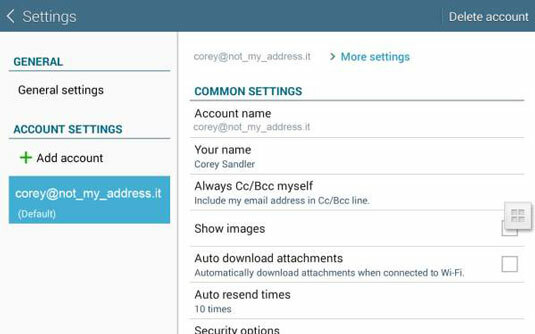 On the Email app’s Settings panel, tap the name of one of your accounts to customize more settings just for that account. Note that in the upper right you’ll see Delete Account. Don’t touch, unless you want to delete that account. Sync Settings. First of all, if you want the email server to send you messages anytime you’re on a Wi-Fi connection, turn on Sync Email. Without that check mark, the only time you’ll get emails is when you load the app. After then, you can make all sorts of adjustments to the sync schedule, even to the point of having different time periods and urgencies for working hours and whatever you call the rest of your day. Whatever you put as your signature can be edited on the screen before you send a message, in case you don’t want to give the full measure of information to everyone. Default Account. Turn on this option to make this particular account the one that sends all outgoing messages, unless you change that setting on the message itself. Only one account can be set as the default. Password. This is a quick way to update your password setting if it has changed on another device. These settings determine how your device will inform your new messages. Email Notifications. An email’s subject can appear in your tablet’s notification panel and briefly in the status bar when it arrives. Select Ringtone. Accept the default or choose a different one. Tap More settings to see more options. Always Cc/Bcc Myself. Press here and tap a check mark in Cc or Bcc so that every message you send comes back to you as a copy. Why would you do this? It’s one way to make sure your tablet is properly sending and receiving messages; if you don’t get your copy, something is wrong. Youngsters: Cc stands for carbon copy, which used to be made by placing a piece of carbon paper under an original in a typewriter or even for handwriting. It was considered proper office etiquette to notify both the primary and secondary recipients that a carbon or duplicate copy of a message had been created and sent. A Bcc is a blind carbon copy, which was a copy that the original recipient was not told had been made. Show Images. You can download and display all images in received emails. Without the check mark on this option, messages arrive and display quicker, and you’re told to tap a button to show images in a message. Auto Download Attachments. When you turn on this option, any attachments are automatically downloaded. If you don’t let them automatically download, you have to request it. Automatic download could slow your system and possibly expose it to malware, although that hasn’t yet proved to be a major problem on Android systems.